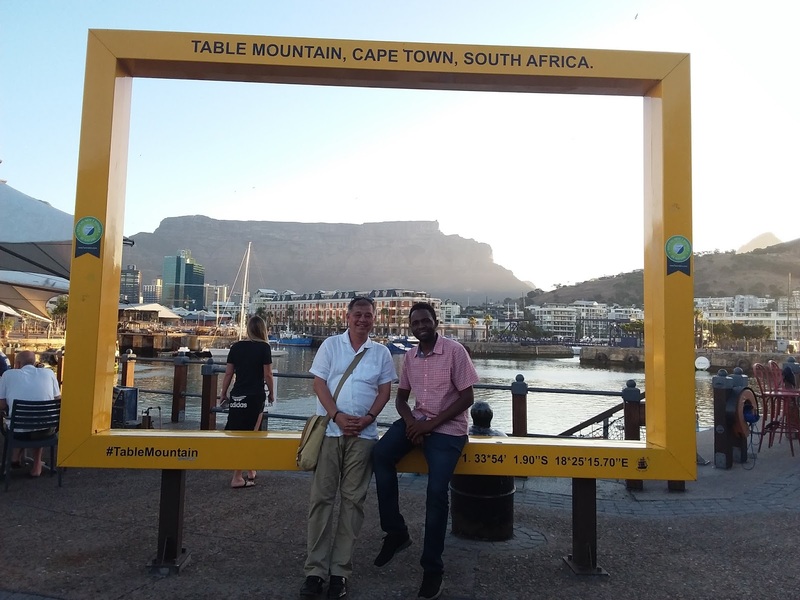 2016-17 Hubert H. Humphrey Fellows at the University of Minnesota, Mmeli Dube (Zimbabwe) and Aung Gyi (Myanmar), flat mates during their Fellowship year at the Humphrey School, reunited recently in Cape Town, South Africa. 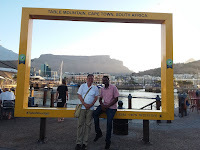 From Aung Gyi: I was in a workshop for "Safety and Security in Asia, East and West Africa and Great Lakes" hosted by the IRC in Cape Town, attended by representatives of around 40 countries from those regions. We were welcomed by a serious water shortage in the city but I'll never forget my visit to Robben Island where Nelson Mandela was imprisoned for 17 years. I had a chance to chat a gentleman who was together with Mandela in the prison. I told him that Mandela and activists have inspired much on our people and leader, Aung San Su Kyi, during democracy movement in our country. He will be remembered to the end of the world. I was very happy to meet my roommate again in the other part of the world. The first evening we met, hugged, and we said " Let's go to Playoffs!" ]former beer pub located in the ground floor of University Village on UMN's East Bank] We compared the Uber in Minnesota and Cape Town, V&A Waterfront shopping and Mall of America, made complaint there was no light rail in the city, enjoyed beautiful evenings." From Mmeli Dube: "Even Aung Gyi's prolific writing, combined with my erratic comments, cannot fully convey the happiness we had when we met. I am happy to say that we reaped some of the fruits the respect and brotherhood we sowed in Minnesota!"